Is it snowing in Bad Hofgastein ?Thank you! (1) At least one overnight stop, (2) requires a whole day, (3) requires more than half a day &ndash; you may have time for a few turns (4) arrive by lunchtime and ski all afternoon, (5) there is a main airport within an hour of Bad Hofgastein. (1) There are no buses or taxis to Bad Hofgastein, (3) there are slow or infrequent buses / trains available, (5) getting to the resort is easy with frequent bus / train connections. (1) No places to stay in/near Bad Hofgastein, (3) a few places to stay in the resort, (5) a wide variety of accommodation suitable to suit all budgets. (1) No luxury accommodation available, (3) just one or two luxury hotels so book ahead, (5) several up-market hotels in Bad Hofgastein. (1) There are no child care facilities at Bad Hofgastein, (5) the resort has excellent child-care facilities including at least one reasonably priced creche. (1) Occasionally gets enough snow for skiing, (2) is often closed due to a lack of snow, (3) occasionally suffers from a lack of snow, (4) rarely suffers from a lack of snow, (5) Bad Hofgastein is snowsure even in the poorest seasons. (1) Bad Hofgastein relies entirely on natural snow, (3) there are just a few snow cannons, (5) there are snowmaking facilities on all pistes. (1) There are no snow groomers at Bad Hofgastein, (3) occasionally some pistes are left ungroomed and in a poor state, (5) all the runs at Bad Hofgastein are groomed daily. (1) there is nowhere to ski when it is windy or visibility is bad and lifts often shut, (3) there are some trees for poor visibility but main lifts sometimes close, (5) Bad Hofgastein is mostly in forest where you can ski in flat-light and windy days, lifts rarely close. (1) If snow conditions are poor at Bad Hofgastein, it will be poor everywhere nearby, (3) there are good alternatives within an hours drive, (5) other locations on the same lift pass provide a rich variety of snowsure ski conditions. (1) Bad Hofgastein usually has poor snow conditions compared to other resorts in region, (3) has average conditions for the region, (5) usually has the best snow conditions in the region. (1) The staff at Bad Hofgastein are rude or unhelpful, (5) lift staff at Bad Hofgastein are pleasant, cheerful and eager to help. (1) The ski runs are featureless and unvaried, (3) the ski runs are varied but not extensive enough for a week, (5) Bad Hofgastein has diverse and interesting pistes including forests and high alpine terrain. (1) No intermediate terrain at Bad Hofgastein, (3) intermediate skiers will get bored after a few days, (5) vast areas of cruising runs. (1) Not even a kicker at Bad Hofgastein, (3) average sized park quite well looked after, (5) huge park area and expertly crafted pipes, jumps and boardercross trails. (1) There is nowhere to go for cross-country skiing around Bad Hofgastein, (3) there are some cross country trails available, (5) the area features many spectacular and well maintained cross-country trails. (1) No designated luge or toboggan runs, (3) there are toboggan runs that open quite often, (5) Bad Hofgastein has long and well maintained luge / toboggan facilities suitable for all ages. (1) Overall, Bad Hofgastein is one of the most expensive ski resorts in the country and not worth the money, (3) overall represents average value for money, (5) overall offers the best value resort in the country. (1) Overall, Bad Hofgastein is one of the most expensive ski resorts in the world, (3) overall it offers pretty average value for money compared to resorts from other countries, (5) internationally the resort offers excellent value for money. For ski hire, The Ski Club of Great Britain recommended Intersport Fleiss in Bad Hofgastein and said that it offered a “good discount”. In reality, Intersport Fleiss only offered 10%, which I do not consider a good discount (especially as the full price for mid-level skis for six days, without boots, was EUR145.00). I could have got the skis via online rental for EUR104.00. The staff at Intersport Fleiss were uncommunicative, surly and unhelpful. They did not offer ski insurance when I rented skis and did not provide any paperwork in respect of the rental. When I returned another day to try to exchange my skis for wider ones, they offered nothing useful. At that point I asked for insurance, which was provided. I paid the additional sum demanded but the shop did not provide any confirmatory documentation. Hence, (I subsequently realised) I had no knowledge of the cover provided or conditions of insurance (thankfully, the insurance was not needed). My conclusion: Avoid Intersport Fleiss! I visited the beginning of Feb 2013. There seem to be many conflicting reports on the resort and I shall try to help by giving an unbiased view. I have skied in many resorts in a number of countries in Europe and can therefore compare them to the Gastien Valley. The Gastein valley is not typical of many Austrian resorts, I found it to be much larger than had been suggested by some posters on this site, certainly enough to keep an intermediate skier happy for a week. I spent most of my time skiing the Angertal and Sclossalm slopes and spent 2 days in Dorfgastein, I also had a trip out to Hochkonig area for a day; this is covered on the Ski Amade pass which also covers some other major resorts in the area. The Gastein Valley slopes are, in my opinion, at the upper end of their grading and best suit intermediates who are willing to take on some slopes that are fairly steep. Some of the blues are fairly steep or have steepish pitches and many reds are challenging, although there are a few less steep slopes I would not really recommend to a beginner as there is little to progress to that does not have some sections that may worry beginners. Experts may get bored after a few days unless they spend time off-piste. When I visited the slopes were busy due to Austrian half-term, though the longest queue was about 20mins for both the funicular and cable car; it is now time that they were replaced with a fast modern 2 stage gondola. Piste marking was lacking; in poor visibility it was possible to find yourself off-piste so great care was needed. Grooming was good but due to it being busy many runs became badly cut up and some had moguls due to this, a good example was the Hohe Scharte Nord which by the afternoon was almost top to bottom moguls. The steeper runs were the most badly affected on the whole. Dorfgastein was, in my opinion, much better. Although busy, it was less so and the runs were far better, they were wider and there were more of them in the trees helping with visibility, the snow seemed better in this area too. Probably a little better for beginners too as a few less steep runs. On-mountain restaurants are good with the standard Austrian offerings and pretty good value. The bus services were like everything else: a little busy. They were, however, frequent and I had no problems using the service to Dorfgastein. The others seemed regular too and the round resort bus from hotels was frequent but sometimes full. In conclusion, the resort is a good choice for those who like red runs and are happy to have a challenge. It can get pretty windy at the top and Dorfgastein is best for poor weather days. I will definitely return but think I would try to visit outside of the school holidays. Visited Bad Hofgastein in Feb 2013 (half-term week) after choosing it based on cost. Having visited Obergurgl last year and Saalbach the year before, we were a little skeptical (mainly due to the height for snow!) but overall, it's an awesome place. The slopes are hugely varied with something for everyone, the piste preparation was fantastic and we'll probably be back! The main problem is the lifts in the town: an outdated funicular followed by a cable car right to the top. It's apparently down to a stubborn local and a land issue so doesn't look like it'll change any time soon. Overall, you should go - it's good value and has a huge range of king across the value. Went to Bad Hofgastein on Good Friday for a week. We went there in 2007 and returned because it's a beautiful town, and the Alpen Therme baths are amazing. It snowed on Easter Sunday, but the snow lower down was nearly gone by the end of the week. I would say there were definitely enough runs to keep most skiers happy. The ski buses are free and very useful. The ski school was excellent and our five year old was going up in cable cars/chair lifts by the end of our week and skiing down happily. We used Angertal as our base station and it has had a lot of investment and is beautifully designed. We stayed at the Pension Heuberger in an apartment and it was very good, spotlessly clean and good value. The restaurant at the Hotel Zur Post was particularly good. Flew in to Salzburg and booked a private transfer with austria-limousine; Erich was helpful and efficient and this was by far the best value transfer we could find to take a family of four plus ski gear, without having to take trains/coaches. After skiing in Switzerland (Crans-Montana, Torgon) in 2008 & 2009, Austria felt like good value and all the people we dealt with and met during the week were lovely. Next year - Italy but we'll definitely return to Bad Hogastein! Bad Hofgastein is worth 3 days, no more. It is smallish, like most Austrian areas, with the skiing predominately above the tree-line. We were there during the traditional ski weeks for the kids (1st three weeks of Feb) , so lots of kids and parents. There is now currently 1 funicular, 1 tram, 3 high speeds, 3 old, low, slow speed chairs and one T-bar. The lift and piste layout could be better, however, it is adequate. The run out at the base gets quite skied off and very dangerous at the end of day. It funnels down into a narrow run which gets steep at points and goes under the railroad bridge. If your edges are not razor sharp and your skills below intermediate, download mid mountain. Heavy snows made going to Sport Gastein impossible. The road was closed there. Avalanche danger was high the whole 4 days we were there. Bad Gastein definitely has limited skiing; most of the runs face the prevailing winds and get blown down to nothing in a hurry. Restaurant at the top of the gondola is quite pleasant and in line with other food venues throughout the Ski Amade area. Think small with nowhere to go for the most part. Dorf Gastein is small with lots of kids and lines. 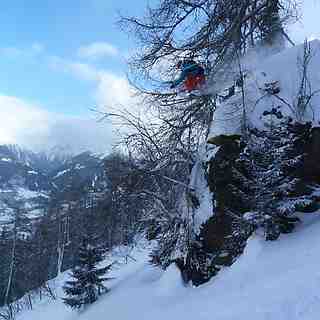 Some tree skiing, some off-piste. Saw the most kids here, no problem with them since they were in classes. It was the most crowded of the three areas. Stayed at the Hotel Astoria, foos and lodging were good to fantastic. Prices on house wine terrific. Limited internet access, 1 pay terminal. In town Cafe Rock is the only place with WLan acces available to the general public. As said minimal Apres Ski, and I do mean minimal. There are enough venues if you have enough friends for a party. Do not go there expecting one. Living in Austria now for the next three years, originally from State. Was a US based instructor for over 20 years. That said the skiing is different from the US, Canadian, or French Mega resorts. That is most of the runs are above tree line, and what looks like good decents are not developed. Expect crowds at most lifts. Food is good through out Austria, keep in mind most of the food is fried however. Other areas worth considering (if you get bored or restless) on the Ski Amade include Flachau, Zauchensee, Wagrain and Alpendorf. All are within a 45 minute drive max from Bad Hofgastein. All in all a very good area in Austria to ski. Great weeks skiing in the Gastein Valley. Stayed at the Palace Hotel in Bad Hofgastein; highly recommended. Unlimited free drinks with dinner (has a small bar area where you serve yourself with beer, wine, soft drinks or just plain old water). The breakfast and dinner are buffet style every day. You can help yourself to as much as you like with a selection of dishes available (no more sitting in the restaurant waiting for your 7 courses of nouvelle cuisine for 3 hours and still feeling hungry at the end). The ski bus stops directly outside the hotel, and drops you in the centre where the schlossalmbahn is situated. Here you can either change buses for Dorfgastein, Bad Gastein or Sport Gastein or stay on board to go too the skizentrum at Angertal. Not much in the way of beginners pistes, more geared to intermediates, with apparently the longest run in the Eastern Alps: red 1 from Hohe Scharte all the way back down to the bus station at Schlossalm. Dorf Gastein has the best selection of runs, however, on occasions the grooming of the pistes was below par, especially after a moderate snowfall on Wednesday. The pistes, the following day, resembled mogul fields, I know it's difficult in this situation, but not one machine was spotted around the Angertal/Bad Hofgastein area, unlike the Stubai valley where, in similar circumstances, the piste machines were out 5 abreast attempting at least to make a difference. There seems to be some confusion between the blues and reds; some of the reds are easily blues, where as some of the blues, although not too steep, were barely 8ft wide in places, not much confidence if you are a beginner. All in, a great area which, if you have transport, is part of the vast ski amade lift pass area. Go on give it a go, I'm sure you won't be disappointed. Good skiing, low key apres-ski, cheap B&B's, friendly locals, very good ski bus links in valley, lots of blues and reds, few black runs, over 200k piste. We visited Bad Hofgastein in Feb 07, a very poor year for snow all round. The valley is split into 4 main regions, two of which are: Dorfgastien/Grobtarl: Nice, usually quiet, tree lined, quite runs, good restaurants at the side of the slopes, quaint Tirolean village (Grobtarl side has the best snow). Bad Hofgastein: has no alpine charm, it is a pretty new looking spa/large hotel town with no apres-ski scene worth mentioning. If you are looking for St Anton/Ischgl parties DO NOT VISIT. The skiing is good, it has a very long run of about 8km from top to bottom worth checking out, this is the biggest ski area which is linked to Bad Gastein. There can be long lines of people waiting for the funicular out of town, so sometimes it is better to get the bus to Angertal and join the mountain there. We stayed in the Haus Wanker Pension (yes that is the right spelling) we were made very welcome by our hosts, the rooms were nice and English is spoken, the best thing was that the rent was only 27 euro p/p night plus taxes, which is half what we have paid in Iscghg or Saalbach for a similar standard of pension. The pension is very central close to the ski bus and Rudi's restaurant, which make very good pizza and is very cheap. The town also has a great Chinese restaurant, and a thermal swimming pool which I was told is well worth checking out, though we did not bring out cossies. Bad Gastein: We did not visit the town but passed through on the ski bus, it has even less charm than Bad Hofgastein and I am told is quite pricey. We skied the runs above the town and they were average, quite exposed and windy, we quickly used the link to return to the more pleasant pistes above Bad Hofgastein. Sport Gastein is where the best snow is, it is a small area and you can ski all the runs at least twice in one day, the top of the mountain is 2600m, it is quiet and it is easy to reach with the very frequent and efficient ski bus service. The one restaurant on the slopes is average and a bit pricey. There are a couple of off-piste runs here. The best is no longer patrolled or shown on the piste map. It involves a long isolated run down the valley to the west of the pistes and meets the ski bus at the bottom, ski guides are recommended. Getting to the Gastein valley is very easy. Rainer Reisen www.rainer-reisen.at run a taxi/bus service every two or three hours from Salzburg airport which must be pre-booked. It only cost 42 euro return per person direct to your hotel a 75 minute trip. They are very well organised. Our plane was 90 mins late and they waited for us. You can also take a train from Salzburg to the valley, though this requires a tram or taxi to the station and a taxi at the Gastein end, I would go for the door to door service. This was a bad year for snow, but Gastein weathered it well, they have plenty of snow making machines and enough height and terrain to find the good snow. Overall, well worth checking out. If you are looking for somewhere cheap or quiet or have visited all the big (200+ k's) areas and just want somewhere different. Though if you want to party, go to Saalbach, Ischgl or St Anton. We will be going back! Going again in Jan 06, great sking, Dorfgastein is a must.